Making your bed is a simple act with powerful consequences. To rise in the morning and complete the first task of the day will give you motivation to do more; to accomplish more. The bed also represents you. Few things in your home are more personal. Making your bed is a reflection of your discipline, your pride and your personal habits. If you can’t get up in the morning and make your bed, what else are you incapable of doing? If you want to change the world, or just make yourself a little better, start off by making your bed. 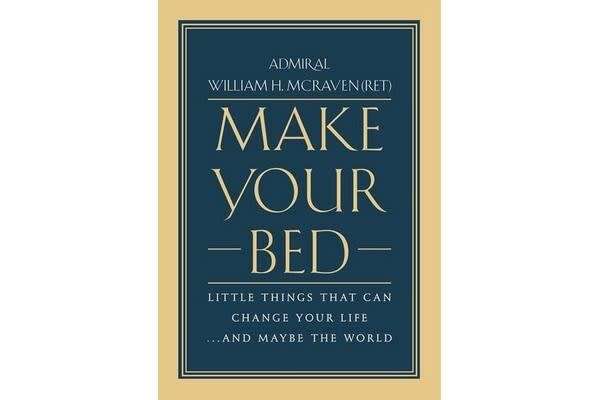 MAKE YOUR BED is a attractively packaged gift book, perfect for Commencement, Father’s Day and the business and military audience, based on a speech the Admiral gave at University of Texas graduation, which went viral to the tune of almost 25 million views. The speech itself focuses on the ten lessons Admiral McRaven learned from Navy Seal training that will help readers face and overcome challenges in their lives and ultimately change the world. Lessons include “find someone to help you paddle,” “don’t back down from sharks,” “start singing when you’re up to your neck in muck,” and of course, “make your bed.” Building from McRaven’s powerful speech, this book will inspire readers to achieve more with thoughtful determination, hard work and the spirit of service.